It’s never easy to host a party. It’s even harder when you’re the featured entertainment. 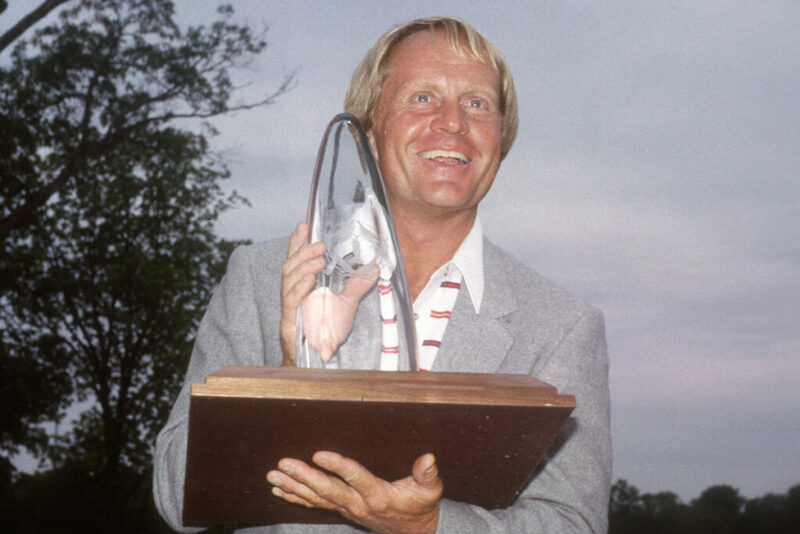 Although Jack Nicklaus has won a record-setting 18 major championships—taking on all kinds of courses, conditions and elite contenders—it has been said, including by the Golden Bear himself, that the first of his two victories in the Memorial Tournament might be the most difficult of his brilliant career. And as the Memorial Tournament presented by Nationwide nears its 42nd playing, it is just the second playing that deserves celebrating—again. May 22nd marked the 40th anniversary of when champion turned esteemed golf course designer Jack Nicklaus turned back into a winner at the 1977 Memorial. As the tournament’s founder and host, and the designer of the 3-year-old host course at Muirfield Village Golf Club, the Golden Bear wasn’t entirely certain he should play in the prestigious PGA TOUR event. An idea hatched while sitting with friends at the 1966 Masters (which he won for his third Green Jacket), Nicklaus brought the event to Central Ohio as a gift of sorts to the sports-loving community which had shaped his life. After opening the course in 1974 in Dublin, the first playing of the Memorial Tournament took place two years later and forever changed the sports landscape in his native state. Was that enough? After all, Nicklaus wondered, would playing in the tournament have a negative impact on its future? Would people think he had an unfair advantage, being all too familiar with the intricacies and nuances that he designed? Perhaps he should solely focus on his role as founder and host, he thought, and leave the golf clubs in the garage of the Muirfield Village home he shared with wife Barbara. Family, friends and associates convinced him otherwise. So Nicklaus entered that first Memorial field in 1976. Despite being preoccupied with the responsibilities associated with running a tournament, including stuffing trash in his caddie’s bib while playing, the Golden Bear tied for eighth in the inaugural event, won by Roger Maltbie. The next year, he was two strokes off the lead after 36 holes. But when Nicklaus holed a bunker shot on his final hole in the third round, he was within one of the lead. He then took over the lead on Sunday, before rain forced a Monday finish. Nicklaus woke up that morning nervous, wanting so much to win, and finished the job in front of several thousand fans that played hooky on a workday. Wins on Monday mornings feel just as good as those on Sunday afternoon. Especially when you’re hoisting your own tournament crystal. “It was probably the most difficult, most challenging, and most rewarding win that I’ve ever had. It was a lot of fun, and I’ll never forget it,” Nicklaus said. Seven years later, he did it again, winning the 1984 Memorial when Andy Bean missed a 3-foot par putt on the third playoff hole. That made Nicklaus the first two-time winner in tournament history and it ended his two-year drought on the PGA TOUR. Throughout his career, Nicklaus won 120 times, including 73 times on the PGA TOUR and a record 18 professional major championships. But lately, the Memorial Tournament field has directed a bright spotlight on up-and-coming talent. In 2016, William McGirt became the third straight winner to record his first PGA TOUR victory at the Memorial Tournament. McGirt’s 165th PGA TOUR start also resulted in the third straight playoff at Muirfield Village. David Lingmerth won the event in 2015 after defeating Justin Rose in a playoff; and a 22-year-old Hideki Matsuyama burst onto the PGA TOUR scene with his win in 2014 after forcing a playoff with Kevin Na. The 2017 Memorial Tournament returns to Muirfield Village Golf Club from May 29th to June 4th, giving competitors from the stacked field another chance to have something in common with founder, host, and two-time winner Jack Nicklaus.